The selection policy states that on 9 November 2018 pre-selected athletes would have confirmed their place (page four of the selection document) and that we would have final numbers of the spaces available for selection in each category. In the article published on 9 October 2018 on the BMC website it was stated that the BMC would publish, on 9 November 2018, the final number of confirmed places that would be available at the selection event. The BMC was awaiting confirmation from Mountaineering Scotland regarding the arrangements for the Scottish athletes. 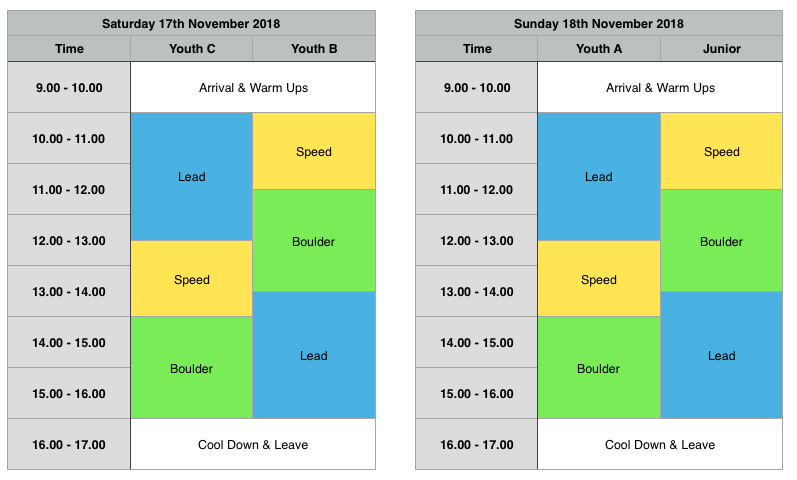 Youth A and Junior athletes can compete as senior athletes in IFSC events, however, the GB Senior Selection Policy has not yet been published. As of Monday 12 November at 3pm both circumstances have been resolved as we have received communications from the relevant parties. The selection panel meeting on 19 November 2019 will follow the selection process as detailed in the selection policy. The total number of athletes selected per category will be exactly as published in the selection policy (detailed on page six of the selection policy). There will be no changes to this. Please find below the provisional timetables for the selection event. The closing date for entries is Monday 12 November 2018 at 5pm. Once numbers are finalised, any adjustments will be made to the timetable and available on the day itself. Arrival and warm up times will remain the same. Start lists for the Selection event can be found here.